Several times a month someone asks what the bunny represents in our logo, or one why my nickname with people I have worked with in law enforcement is rabbit. Normally I just snicker and just say “long story” and leave it to their imagination. It is not because I am embarrassed about the nickname and how I got it, it is just that, a long story. 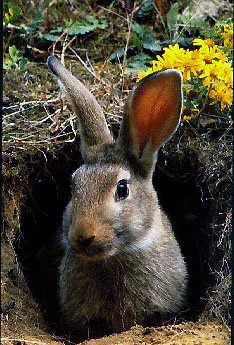 So to set the record straight, I will answer on my blog, the meaning of the rabbit. On October 10, 1978, I started my law enforcement career as a deputy sheriff recruit in a class of eighty at the Phoenix Police Academy. The first week at the academy was called hell week, as the instructors attempt to wash out as many of the new officers they could. After a day of intensive class work and physical exercise, we were sent home with a long list of items that had to bring with us to class the following day. On day one we had to purchase a particular pair of gray gym shorts, stencil our name on them, then polish our brass, spit shine our leather and write out a 5000 word essay on why we wanted to be a police officer. One thing that they fail to tell you during these assignments is where in the Phoenix metro area you could go to purchase these particular hard to find items! After an extensive search, working the telephone and driving from store to store, I was able to locate one of only three locations in the Phoenix area that stocked these shorts as they were closing for the night. Getting home with the shorts after 10:00 pm, I carefully stenciled out my name, polished my leather and brass and wrote out my 5000 word essay. By the time I got to bed it was 4:00 am and I had to be on the academy grounds at 6:00. Day two’s assignment were similar, in that we had to locate a particular black 2” binder and have it divided into sections for particular titles of class work, polish our brass and leather, and then write a 5000 essay on our autobiography. Prior to leaving for the day, a few classmates and I decided to team up and work together in locating the binders. As a team, we quickly located one of five stores in the Phoenix area that had them. However a few other classmates had gotten there before us and there were only two left. The store owner referred us to another shop on the other side of town where we were able to get another two for the other members of our team. After getting my binder ready and spit shinning my leather, I started my 5000 word essay at 2:00 am. As I wrote I remember slipping in and out of conciseness as I tried to stay awake. During my conscious state I remember thinking back to my early childhood, growing up with my pet rabbit named “Dicky”. At 5:30 am I some how managed to wake up at my desk with my essay scribbled out, only having minutes to spare before class formation at the academy. That day our little team grew to add a few more students and we discovered that by helping one another, that our class assignments would be easier to accomplish. During formation on Friday afternoon, just prior to dismissal, our class Sergeant said that he wanted to congratulate the remaining fifty recruits. However, he was disturbed by one student’s autobiography and wanted to address it before the entire class. I started choking as he remarked that after reading everyone’s essay he felt that one of the recruits had a weird perversion to animals. He then asked that if anyone in the class had a perversion to step forward. I was certain that the class sergeant was referring to my essay about my rabbit and as I began to move, another recruit quickly stepped forward. I stepped forward. The Sergeant then asked about my perversion. I explained that as a young child that I had a pet rabbit and that I used to walk it on a leash and that the rabbits name was Dickey. The other 49 class members of the class were doing everything possible to keep themselves from doubling up in laugher during this exchange, and from that moment forward in my law enforcement career, I was known as Rabbit. The nickname Rabbit still sticks with me today as a member of the Arizona Choirboys Law Enforcement Motorcycle Club and serves as a reminder of an important lesson that I learned over 25 years ago. Difficult assignments can be successfully accomplished when you work as a team!